Andrea's World Reviews: Christmas Wishes - Ryobi ONE+ 18-Volt 1/2 in. Lithium-Ion Drill Kit Review & GIVEAWAY!! Christmas Wishes - Ryobi ONE+ 18-Volt 1/2 in. Lithium-Ion Drill Kit Review & GIVEAWAY!! Are you struggling to find the perfect gift for the special man on your list? That is me every year. I know what my husband loves. The problem is that I know too well. The past few years I have found so many sports fan items, boots, colognes and the like that I knew he would love, and I proceeded to buy them all. That may sound great, but now that he has all of that stuff, it would be silly to get him more of the same, which basically meant I had to start from scratch and find new things that he would like. Since that is pretty much the only categories he shoes any interest in, it means I actually have to know what he would like, even when he doesn't. My husband is not really the "Mr. Fix it" type of guy, so I have always hesitated to get him a lot of tools. I actually usually do most of the assembling of toys, storage units, etc. for our household, so I was worried they would be a poor gift for him. Occasionally though, there will be a job that I am not very good at and need his help with or something that he decides he wants to do on his own. In those cases, he is stuck using the very limited collection of manual tools we own(hammer, screwdriver and wrench), which makes it extremely difficult. I figured that having at least one power tool could only be helpful, and figured he would appreciate not having to work as hard to accomplish tasks that should be simple. Since it was a gift(and even if it wasn't) I wanted to make sure I got him the best quality available. I chose Ryobi since it is a brand I trust implicitly. I chose the Ryobi ONE+ 18-Volt 1/2 in. Lithium-Ion Drill Kit with 2 Batteries. It is the kit to start out with. The kit includes the 18-Volt ONE+ 1/2 in. Cordless Lithium-Ion Drill/Driver, two 18V ONE+™ Compact Lithium-Ion Batteries, charger and storage bag. I had planned to save it for Christmas, but just as I mentioned, one of those times came up again, where he needed a tool. I figured it would be an even better gift to make the job easier for him now, when he really needed it, so I gave it to him. He LOVED it. I never thought he would be so excited about a tool. I knew this was the perfect choice for him because it is not only a drill, but essentially a power screwdriver, which will be what he gets the most use out of. We screw all the time, so it's a no-brainier. Like I said. He was thrilled to have something to make his work away from work a little easier. 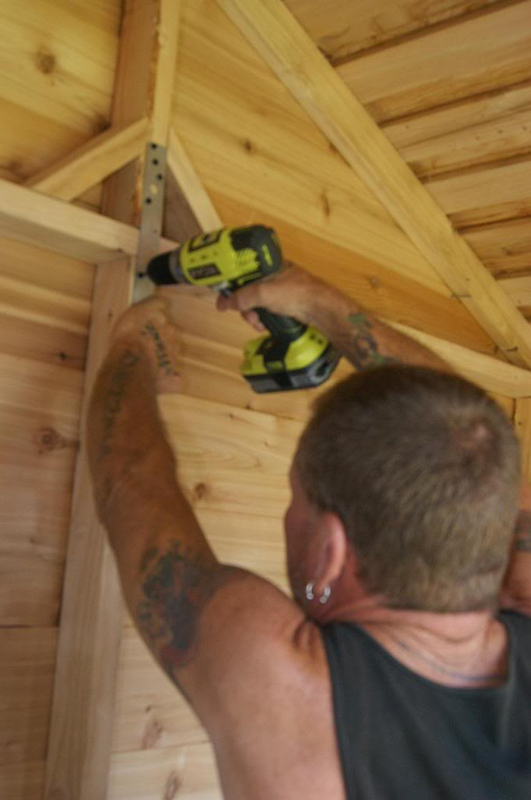 He needed to add support brackets to our wooden shed, and nails proved to be a pain and a manual screwdriver would have been a torturous ordeal, but with the Ryobi ONE+ 18-Volt Lithium-Ion Drill, it was a speedy and effortless task. He said thank you for the drill about 6 times, which was shocking since I was initially worried he would not even like it. I am so glad I trusted my instinct and got him something that would be practical, because it ended up being one of his favorite gifts I've gotten him(and I've gotten him some really nice things). For those that know a lot about tools and want to know the specifications, the drill includes a 1/2 inch heavy-duty single sleeve, keyless chuck with a 24 position clutch, exclusive MagTray and on-board bit storage, which allow convenient placement of bits and screws. The best feature, in my opinion, is that all 18-Volt One+ batteries work in every Ryobi 18-Volt One+ tool ever made. That is wonderful because after how happy he was with this drill kit, I plan to get more Ryobi One+ tools for my husband. As his collection grows, all his tools will be able to share batteries, so nothing will ever be uncharged. If you are trying to find a great gift for the handyman or not-so-handy man in your life, the Ryobi ONE+ 18-Volt 1/2 in. Lithium-Ion Drill Kit would be a great choice. It makes such a great gift that Ryobi has generously offered to host a giveaway for you all. 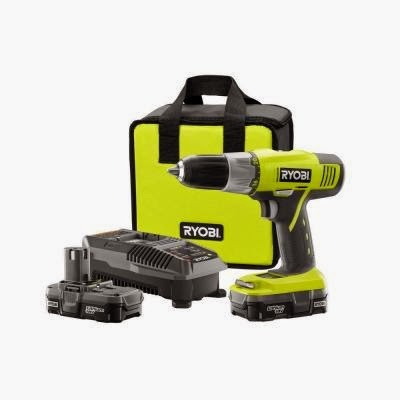 One lucky winner will receive this amazing Ryobi ONE+ 18-Volt 1/2 in. Lithium-Ion Drill Kit. Enter below for your chance to win this fantastic prize, and be sure to enter all the other fabulous Christmas Wishes giveaways HERE. There are thousands of dollars in prizes to be one from 10 different blogs. THE FINE PRINT: All entrants must be 18 years of age or older. Please read each giveaway 's directions carefully as entry methods differ, and giveaways may be open to different world areas. Please make sure you leave a way (valid email address in form or comment) with your entries to be contacted if you win. Please note that Momma Told Me, Blog POP! or the Blog POP! bloggers are not responsible for sponsors that do not fulfill their prizes. We have represented each sponsor with the expectation they will fulfill their prize and in a timely manner we will contact the sponsor regarding your prize(s). The sponsors, in most cases, are shipping their items to you directly and prizes will likely not arrive in time for the holidays due to event and giveaway timing. We will make every effort to assist you obtaining your prize should concerns arise after winner's notification. If there is an issue with a sponsor please notify the blog owner no sooner than 14 days from prize notification and no more than 6 weeks, for assistance, after that we may be unable to assist you. My man is fix almost everything but recentlty his tool box got left outside and all his tools ruined so this would be the first tool he would have (: I would love t give it to him for Christmas! Thank you for the chance to win. No man in my life, but I could definitely use one! My hubby is the drill master, but he is always needing tools. This would be awesome to win for him. I might wrap it up for Christmas if iI win and ts here on time. No man in my life but I could sure use this drill myself as I am a drill master. This drill would be the first step, but it would be greatly appreciated! We are always borrowing one from my dad. I am the man in the family and I have started a lot of work in my very old home but the tools I have aren't in the best of shape. The man of the house is pretty handy and he would love this fine piece of drill. I'm the man.. and no I'm not good with power tools.. this would be a nice first step. I think I am pretty handy. My husband is very handy! I'm handy and could use this! My husband is very handy!!! Unfortunately he breaks more stuff than he fixes. Or he breaks something and then has to fix it! lol He has a few tools that he's accumulated over the past couple decades. Nothing fancy like this though. My husband is very handy! He could use new tools for around the house as his are getting old!! I am on my own for the first time in my life so this would be for me and it would be a first. My husband is not very handy so this drill would be a big help for him. my husband knows tools and to build things, do most anything. I lived in an old house before we got married, so I'm the handy woman of the house. My hubby is an amazing cook so we each have our talents. He's already quite handy thank goodness! Have a man. He's no drillmaster. Looks like I better learn soon. Looks like a great tool! I want these tools for myself....I have so many things that need to be done around the house and waiting on my friends to have the time to complete them gets old...I can be a drillmaster. This would a drill for a up and coming handy man. My son has taken a liking to fix things up around the house and use recycled wood to make bird house. This would be for him. Well I am the man of my life and I would say I am in between Handy Master and first step. Not the handiest of men but I can hold my own on an average guy level. He thinks he's a jack of all trades but sadly no. This would be the first step. He's getting there but this would definitely help. The guy in my life is already very handy. But he needs good tools behind him to keep him that way! There are just some things you can't do with your bare hands! Ryobi is a great brand of tools and my grandfather swears by them. My husband is pretty handy. He's no expert but he's fairly good at handiwork. He'd love this tool. Thanks. He's been a carpenter for over 30 years. My hubby is really handy! He blows my mind with all the repairs he is able to do on his own! The drill would be the VERY first step! He needs to get a little more manly! My hubby is pretty handy. He is a do it yourselfer in training. No man in my life so this would be for me! My husband is a carpenter so this would be great for him. He is in need of a new cordless drill before his gives out. I'm definitely the handyman in my house. Fix everything I can, including some of the things I probably should have left to the experts. He is a handy master and needs a new drill. My guy is a handy man grease monkey and loves to fix things himself. My husband is not handy, but he could use this to hang all the pictures and artwork I have. My husband is pretty handy and needs new drill this would be great! hes a handy guy for sure we need this!! Yeah, uhh, my man is a geek, so we uhh, need to work on the handy part. Hehehe. Very nice article! Ryobi ONE+ 18-Volt Tools are very effective for us. I always buy a lot of cheap stuff from Ryobi ONE+ 18-Volt Tools. Really, it’s great. If you are shopping for a light weight and capable driver drill, then you may want to check out at the Makita BDF452 Driver Drill Kit. Even though it is lighter than the other driver drills, it is nonetheless more beneficial because of its fantastic attributes.